Soldiers sat atop trucks distributing rice and water on Thursday in typhoon-devastated Tacloban as chainsaw- wielding teams cut debris from blocked roads, small signs that a promised aid effort is beginning to pick up pace even as thousands flocked the airport, desperate to leave. Soldiers sat atop trucks distributing rice and water on Thursday in typhoon-devastated Tacloban, Philippines, as chainsaw- wielding teams cut debris from blocked roads, small signs that a promised aid effort is beginning to pick up pace even as thousands flocked the airport, desperate to leave. The first C-130 transport planes arrived at 3 a.m. at Tacloban airport, the first nighttime flight since the typhoon struck on Friday, suggesting air control systems are now in place for a 24-7 operation — a prerequisite for the massive relief operation needed. Food, water and medical supplies from the U.S., Malaysia and Singapore sat on pallets along the tarmac. Military officials were among the thousands waiting outside the airport trying to get their families out. "My family has nothing to eat, and we have no place to stay," said Sgt. William Escala. "We cannot bear the stench. The kids are getting sick." While the cogs of what promises to be a massive international aid effort are beginning to turn, it is still not quick enough for the 600,000 people displaced, many of them homeless, hungry and thirsty, their livelihoods destroyed. Much of the aid — and the staff needed to distribute it — is stuck in Manila and the nearby airport of Cebu, a 45-minute flight away. Some among the desperate residents have resorted to raiding for food. Mobs overran a rice warehouse on Leyte, collapsing a wall that killed eight people. Thousands of sacks of the grain were carted off. But police say the situation is improving on the ground. Tacloban Mayor Alfred Romualdez urged residents to flee the city because local authorities were having trouble providing food and water and maintaining order, The New York Times reported. He said the city desperately needed trucks to distribute relief shipments accumulating at the airport as well as equipment to pull decaying corpses from the rubble. Despite those incidents, police said the situation was improving. "We have restored order," said Carmelo Espina Valmoria, director of the Philippine National Police special action force. "There has been looting for the last three days, but the situation has stabilized." The death toll rose to 2,357, according a national tally kept by the disaster agency. That figure is expected to rise, perhaps significantly, when accurate information is collected from the whole disaster zone, which spreads over a wide swath of the eastern and central Philippines but appears to be concentrated on two main islands — Leyte and Samar. Gegham Petrosyan, from International Committee of the Red Cross, said destruction along the south cost of Samar island had been "massive." "People are desperate for life-saving aid," Petrosyan said. "However, logistical and security constraints continue to hamper the distribution of desperately needed relief." Meanwhile, a run-down, single-storey building with filthy floors at the ruined airport in Tacloban has become the area's main medical centre for victims of last week's powerful typhoon. It has little medicine, virtually no facilities and very few doctors. 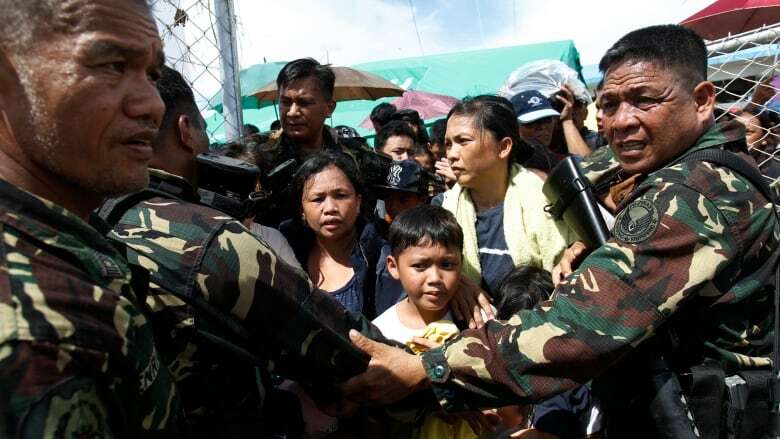 Hundreds of injured people, pregnant women, children and the elderly have poured into the squat, white building behind the control tower since Typhoon Haiyan ravaged the eastern Philippines on Friday, killing thousands of people and displacing many more. Doctors who have been dealing with cuts, fractures and pregnancy complications said Wednesday they soon expect to be treating more serious problems such as pneumonia, dehydration, diarrhea and infections. The medical woes add to the long list of daunting tasks for authorities, including dealing with looters and clearing the bottlenecks holding up thousands of tonnes of aid material from coming into the region. "The priority has got to be, let's get the food in, let's get the water in," UN humanitarian chief Valerie Amos told reporters after touring Talcoban, the capital of Leyte province. "We got a lot more come in today, But even that won't be enough. We really need to scale up [the] operation in an ongoing basis." Amos's office has released $25 million US in emergency relief funds, accounting for a chunk of the millions of dollars pledged by countries around the world. Canada announced on Wednesday that it would, upon request, prioritize the processing of immigration applications from Filipinos who have been "significantly and personally affected" by Typhoon Haiyan. It also said Canadians in the Philippines who have been left without travel documents because of the typhoon will have their applications expedited by the Canadian embassy in Manila, and that Filipino citizens who are temporarily in Canada and wish to extend their stay will be "assessed in a compassionate and flexible manner." With the local police force unable to operate — most were victims — the government rushed thousands of soldiers and 600 policemen from other parts of the country. The security forces, including army engineers, are helping clear roads and remove the dead, many of them on roadsides. A 6 p.m. to 6 a.m. curfew was in place. "There's a lot of dead bodies outside. There's no water, no food," said Dr. Victoriano Sambale, one of the dozen medical staff tending to thousands of people at the airport clinic. Until Wednesday, there was no anesthetic, so open wounds had to be stitched without it. "Patients had to endure the pain," Sambale said before he was suddenly summoned — another pregnant woman had shown up. Clutching her swollen belly, 26-year-old Reve Rose was writhing in agony while rolling on her side on a wooden bench as her nervous husband looked on. Her first child was not due until around Christmas, but she feared she was in labour already. Sambale felt her belly and tried to calm her down, certain it was just a panic attack. "I am nervous, sad," she said. "The house is lost. Everything is gone." Since the storm, people have broken into homes, malls and garages, where they have stripped the shelves of food, water and other goods. Authorities have struggled to stop the looting. There have been unconfirmed reports of armed gangs of robbers operating in a systematic manner. The congressman for Eastern Samar province, a coastal region that bore the full force of the storm, said 211 people had been killed there and 45 were missing. "The situation there was horrible," Ben Evardone told a local TV station. "Some communities disappeared, entire villages were wiped out. They were shouting 'Food, food, food!' when they saw me." The government says planes, ships and trucks were all on their way, loaded with generators, water purifying kits and emergency lights — vital equipment to sustain a major relief mission. Airports were reopening in the region, and the U.S. military said it was installing equipment to allow the damaged Tacloban aiport to operate 24-7. A Norwegian ship carrying supplies left from Manila while an Australian air force transport plane carrying a medical team took off from Canberra. British and U.S. navy vessels are also en route. U.S. Brig.-Gen. Paul Kennedy promised a response akin to the widely praised U.S. military one after the 2004 Asian tsunami, when fleets of helicopters dropped water and food to hundreds of isolated communities. "You are not just going to see Marines and a few planes and some helicopters," Kennedy said. "You will see the entire Pacific Command respond to this crisis."